The Unofficial Miss Demeanors Conference Packing List The Miss Demeanors are off and running this week. Alexia (who is an nominee for an Agatha for Best First Novel), Tracee (who is a writing conference virgin), Paula, and I will be attending the Malice Domestic conference sponsored by Sisters in Crime. Poor Susan is traveling to England where she will be meeting her writing hero, Alison Weir. I asked each what they considered to be essential items to pack for a conference. I’d say my list pretty much mirrors theirs, although Robin’s got an idea only a cyber expert would think of. I do pack a swimsuit because most hotels have a pool and for solitary writers who are spend lots of time alone, conferences can feel stressful, although fun. A quiet dip in a pool can revive me. And I confess that I bring a flask with some libation in it, cocktail napkins, and perhaps some nuts or crackers for the same reason. A quiet drink in your room alone or with just a few people can bring a little relief to the chaos of a conference. Never let it be said, I undermined the reputation of writers with a handy flask. Paula:I always take business cards, postcards featuring my books, copies of my books, my cell and my iPad and my chargers. I have a couple of trade paperbacks as well as e-books and manuscripts on my tablet so I’m never without good reading material. My conference wardrobe consists of four-season clothes only and a makeup bag that goes everywhere with me. I have been searching for the perfect leather backpack with a padded laptop pocket for years and if I find it, I’m buying it. I have several that turned out not to be perfect, and so the search goes on…. Alexia: I haven’t been traveling to conferences for long, only about a year. I pack for conferences, clothes-wise, the same as I pack for any other trip: travel-friendly separates that fold up small, resist wrinkles, can be washed, and fit into a carry-on. Traveling solo taught me not to pack more than I can carry. I usually pack a duffel bag and tote because I hate checking luggage. 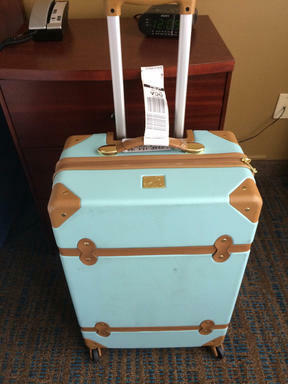 However, I’ve started using my hard-sided wheeled 21″ case as a checked bag so I have a way to carry books home post-conference. I also bring business cards and postcards/bookmarks, pens to give away, pens to write with, notebooks to write in, a paperback book to read, a 7 inch tablet, my phone, chargers, a battery pack, and both a 3 foot and a 6 foot charger cord. I only rarely take my laptop–the tablet is smaller, lighter, and more TSA-friendly (not every airport offers TSA Precheck). Other than a tiny bottle of hand lotion, chapstick, and hand sanitizer which I use in transit, and sample sizes of my face creams, I don’t pack toiletries because I can buy them when I get where I’m going. The only truly “can’t live without” items are my phone, which can do everything a laptop and tablet can do (tiny screen and keyboard get tedious, though), the charger and the 6 foot cord (outlets are never in convenient places), and pen and paper. And credit/debit cards. Tracee:This will be my first conference as a published author so I’m sure the list will change from here on out. At previous conferences I’ve made sure I have business cards and notebook/pens. Going forward, I’m adding book swag (postcards or bookmarks, etc.) and a copy of my book (for the table during a panel). Of course, there is the other general travel stuff – I love itineraries! The thing I really wouldn’t want to be without is my current book (even though technically I should be able to get one there….). I also never travel without Benadryl as a sleeping aid (I mean allergy relief) in case a hotel doesn’t quite agree with me or I’m on a different time zone. I’m looking forward to reading your lists. This may prevent me from forgetting the very thing I couldn’t do without. Susan:I always bring bookmarks. Since my Maggie Doves are digital, I always have some sort of gift coupon so people can download it. Of course, I’m always reading a book, and it becomes a nice memory that I associate with the conference. For example, I was reading a book about Patty Hearst at the Writers Police Academy and those two things are linked in my brain. Robin:I pack business cards, a notebook, pens, my laptop, Kindle and chargers for all electronics. I get paranoid about backups of WIPs so I usually carry at least one USB thumb drive. Something I bring that I’m betting is unique is a spare webcam cover that I stick over hotel door peepholes. Reverse viewers are much too easy to buy or make as the world found out during the Erin Andrews privacy trial. Until I have a debut ready to hawk, I suspect I can make a memorable impression by giving away webcam covers featuring our Miss Demeanors logo. I’m ordering enough for all of us to have a supply to give away 🙂 Cate:When I go to conferences, I bring business cards and my Kindle-equipped phone for all the books that I hear about and need to start reading immediately. I also bring my computer. Whenever I can find a moment, I write. Sometimes, even when I should be marketing, I’m in my room writing. It’s quiet time with just me in a hotel. Who can pass up such a nice chance to get real work done?